Born and raised in the United Kingdom until the age of twenty-one, Mark Astor has been an attorney since 1994. Before entering private practice, Mr. Astor began his legal career as a prosecutor with the Palm Beach County State Attorney’s Office. Mr. Astor served the citizens of Palm Beach County as an Assistant State Attorney from 1994-1999. During his career as a prosecutor, he served as Chief of two different County Court Divisions and, thereafter, was promoted to a felony trial division. He has handled thousands of cases ranging from first-degree misdemeanors to Capital Murder. Mr. Astor was admitted to the Florida Bar in 1994 and, in 1995, was admitted to practice before the U. S. District Court for the Southern District of Florida. In 2005, he was admitted to the District of Columbia Bar. He received his Bachelor of Arts Degree from the University of Michigan in 1990, his Juris Doctorate from Nova Southeastern University College of Law in 1994, and his Master of Laws Degree (L.L.M.) from American University, Washington College of Law in 2005. 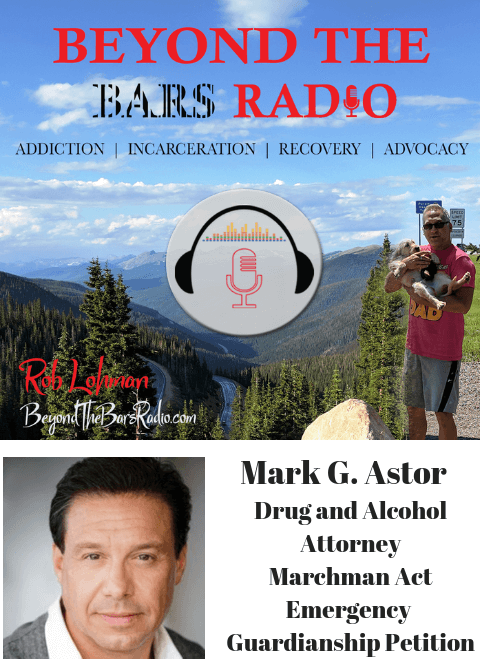 Mr. Astor’s law practice, Drug and Alcohol Attorneys (https://drugandalcoholattorneys.com) focuses on representing and empowering individuals who are in crisis because of drug, alcohol and mental heath disorders. Many times, individuals or families come to Mr. Astor because they have a friend or loved one who either refuses to go into treatment, or will not stay in treatment. When this is the case, Mr. Astor gives counsel to help navigate through the Marchman Act process, Florida’s involuntary commitment law for drug, alcohol and co-occurring mental heath disorders. Additionally, Mr. Astor provides counsel when there is a need to file an Emergency Guardianship Petition (ETG) so that an individual who is no longer competent to make medical decisions for themselves can have that burden taken off their shoulders. On other occasions, individuals find themselves in the criminal justice system and need assistance navigating it’s complexities, having been arrested for an offense that stems from drug addiction or mental health disorders. When he’s not working in his law practice, Mr. Astor empowers members of the community by teaching Krav Maga (the Israeli system of hand to hand taught to the military, special forces and anti-terror units). He also enjoys an early morning work out believing that a healthy body leads to a healthy mind.